A note to the aspiring young closer,It’s time you were let in on a little-known secret. A secret which hides in plain sight on the face of every rep who has once again fallen short despite an ever-increasing fidelity to their company’s corporate selling methodology:* In the Digital Era, the way you’ve been taught to sell isn’t just ineffective, it's diametrically opposed to your ability to consistently attract, cultivate & close new business *That’s because in the Digital Era it is time that is the currency of choice, and while digitally savvy B2C organizations like Amazon are staking entire corporate strategies around getting the customer what they need via an experience ever more time-friendly and seamless, B2B sales organizations are teaching young reps with sales methodologies that are the opposite. The result is a lot of deals lost not because our prospects wouldn’t ultimately find value in our company’s product or service, but because they aren’t willing to commit to the drudgery of the sales-cycle, or succumb to meeting fatigue before they reach its conclusion. 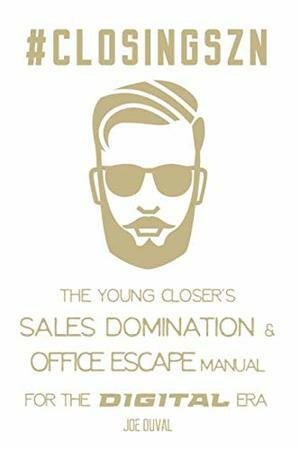 As the top sales rep within his business unit two years in a row at the $3.5B tech giant Gartner, former dealmaker & entrepreneur Joe Duval draws on his own experience to help equip young sales professionals with the updated selling philosophy needed for the Digital Era.Across three parts – The Sales Manual, The Mental Manual, & The Office Escape Manual – #ClosingSZN gives aspiring closers actionable advice for delivering the type of sales experience that keeps prospects engaged during the amount of time it can take to complete a high dollar, complex sales transaction at a B2B level. The reader will also find practical guidance for leveraging their “closer” status to escape the office and dictate when, where, and how they conduct their business. The Sales Manual - How digital giants like Amazon in the B2C arena have changed what compels prospects to buy during B2B sales interactions - Why the value you are personally able to deliver during sales cycles has now become the most important variable in whether you ultimately close the deal - Why every closed deal is comprised of at least two distinct sales cycles, and the differences in approach required by each The Mental Manual: - Why your sales organization ends up training you for sales mediocrity, not greatness - How closers are able to play chess while other reps play checkers - Why a Buddha-like ability to stay present is the ability which makes all the others flourish for the young closerThe Office Escape Manual - Why escaping the office has become imperative to personal fulfillment and financial prosperity in the Digital Era - How to leverage your status as a closer to dictate where, when, and you conduct your business - How fly the coop and set yourself up for traveling the world while keeping your six-figure sales gig with all the trimmings Whether you’re after the ability to close a prospect in a New York office from a Land Rover in Iceland, or simply want to earn more by selling in a way that is better aligned with the buying expectations of the Digital Era, #ClosingSZN provides a better way forward for the aspiring rainmaker. Better for you, better for your prospects, and better for your bank account. Welcome to #ClosingSZN.